As of this post, all art sent! 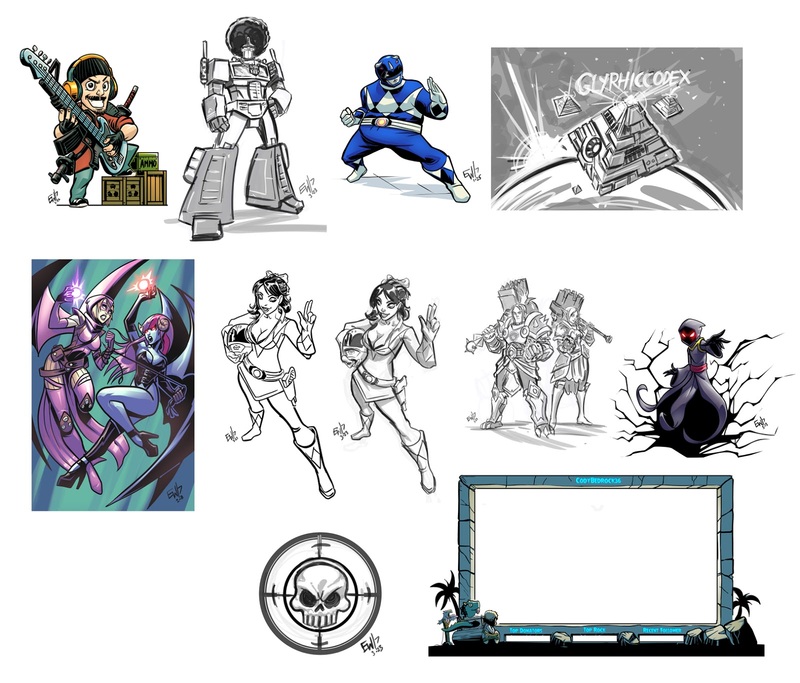 Well, above you can see the collective art works done today during Drawing Request Show episode 195 as well as the morning color upgrades stream. Fun stuff! Thank you to SuchiKuchi and her followers for raiding during today's stream! Was fun having you. Thank you to all the supporters today for getting us to TWO tip goal giveaways and hitting the Follow Goal and unlocking the special Follow Goal giveaway! Now on our way to 550! See you at the next live stream, every M-F 2pmET! As of this post, all drawings sent! Check your whispers! Managed to get a sad kid and a stare down between Darth Vader and Dr Doom done before the donation train poured in and the gratitude wheels went a flying. Also cracked loose 3 giveaway wheel spins! Thank you to the amazing support of rhainne, kingkonigtiger, trayde, epelesker and calder and everyone who was there. Thats how we get over the hump baby! Thanks a bunch! Miss the madness?? Enjoy this hour long clip of the insanity! My apologies for an occasional muting by Twitch censors. Enjoy! Eventualy we did get back to drawing. The Requesteers keep trying to break me. As of this post all art sent! 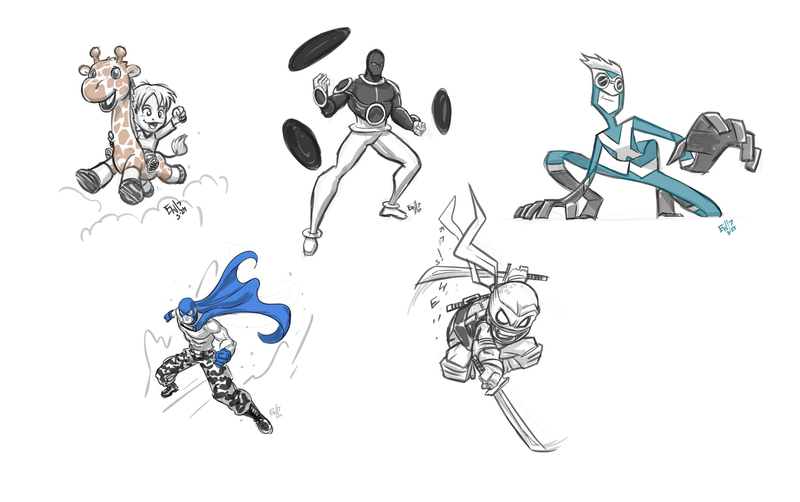 Had a ball drawing today and getting distracted by the hyper folks in the chat! Great stream. Do it again Wednesday 2pmET! See you then! As of this post, all the above art has been sent! The two inked chibis are also on their way to Kristina for coloring! Thanks everybody for your requests. Had a hella fun stream and craziness. I tanked out at the end from not having much to eat today hahaha. But the power of thy JELLY BEAN got me through some epic giveaway wheel spins! Do more tomorrow - going to be working on Inking Drawing Requests at 10am and doing more Drawing Request Show at 2pmEST! See you then! Catch Eryck Webb streaming live at http://www.twitch.tv/eryckwebb every week! Thanks to all who came out, have a fantastic weekend, and as of next week we start incorporating inks and colors into the stream on a regular basis! As of this post, all art sent. Check your whispers! 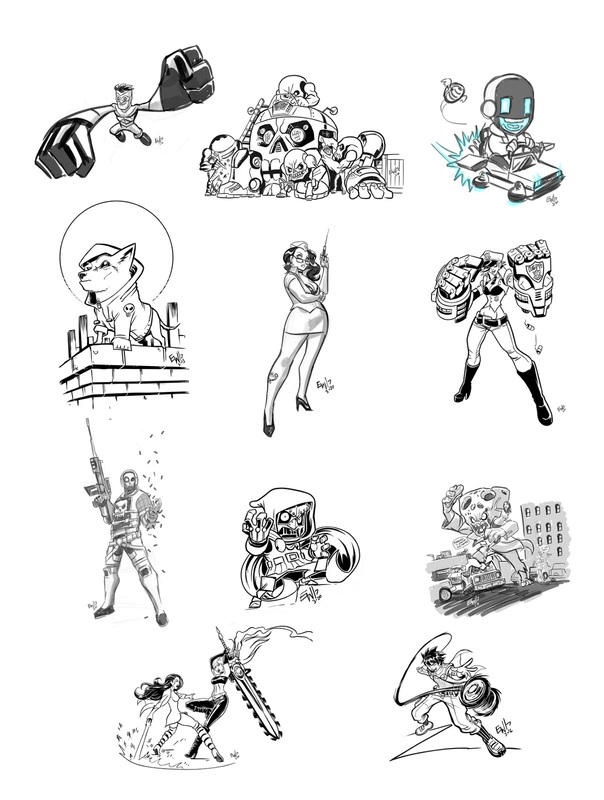 This is all the art I drew, inked or colored today! Fun stuff but a long day! Thank you so much everybody! Looking forward to doing it one more time tomorrow to wrap up the week! See you guys 2pmEST! Miss the stream? Heres a highlight from one of my favorite drawings of the day! As of this post, all art sent! Check your whispers. Episode 189 was rolling along good I was drawing some fun requests and then it sort of took a few swerves towards giveaways and gratitude wheels :) Big ups to Trayde and LeoKage for making MightyMae's birthday special. And hope Mae enjoyed the special Game Of Fate birthday gift :) Eat some cake for me Mae! See you guys in the morning for Color Upgrade fury 10amET in the morning! See you at the next live stream at twitch.tv/eryckwebb M-F 2pmET and T/TH 10am! Sometimes do EWG commission streams M/W/F! Till next time, keep drawing! As of this post, all art sent! So, today was about 9 hours of streaming with 30 minutes of BRB to get some lunch and spent a few minutes outside. 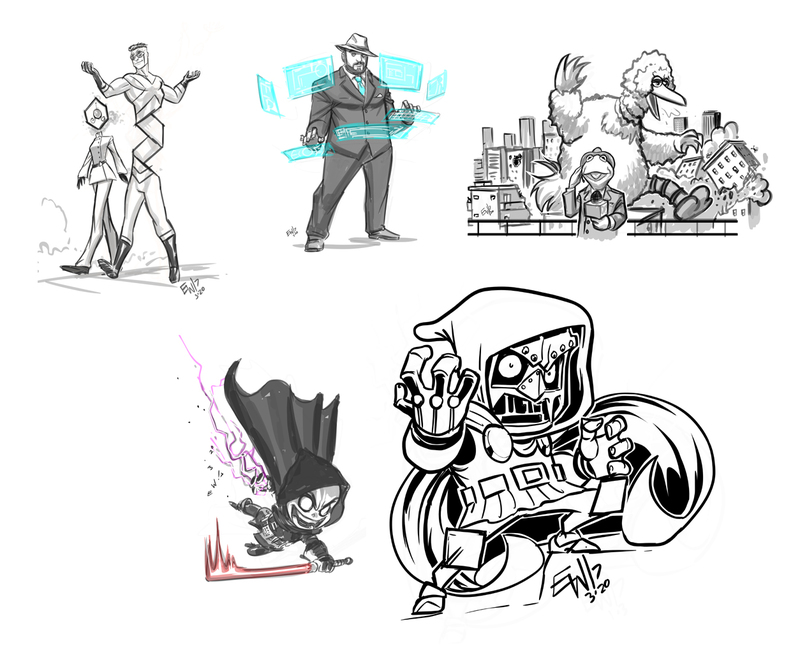 One helluva day, drew lots of really cool stuff. All the inked pieces above have been colore guided and are off to Kristina to flat. The drawings awaiting upgrades are sittin in the queue ready to go. Thanks so much everybody! Tomorrow DRS returns at 2pmEST! Till then, have an excellent night! See you at the next live stream at http://twitch.tv/eryckwebb every M-F 2pmET and other shows by announcement weekday mornings/ nights and weekends! As of this post, all art sent! Hella fun first day back of the week. Happy first day of spring. And thank you so much to all who came and hungout. Was a blast. I will admit I got on a couple geek rants so I didnt get TONS of drawings done. But technicaly the big bird piece was two characters, as was the infinix and friend one. So my goal is averaging 7 pieces per stream. And this was met. Thanks so much all and do it again tomorrow at 2pmET! And dont miss the ink upgrade magic on the morning DRS Upgrades stream! 10amET! Miss the stream? Heres a clip! Just finished episode two of Iron Fist on netflix. Ashamed at letting myself be discouraged for it by negative bigot troll reviews and commentary on internet. Kung Fu? Check. Threat oh The Hand? Check. Super powered punch? Check. Interesting story? Check. Cool wandering monk with no shoes vibe? Check check. Looking forward to the rest of it. Enjoyed it very much so far. Its already more likeable with more energy than the slow plodding luke and jessica series. This had a solid couple kungfu moments in the first 10 minutes! Will give full feed back after finishing the series with an open mind, and no expectations going forward. I encourage all to do the same. As of this post, these 3 pieces sent! I drew 5 characters total during todays St Patricks Day themed stream! Not bad considering we had a giveaway every hour via the Blarney Wheel created just for todays stream. Lots and lots of fun and sillyness. Its friday, its almost the weekend. And its been a long work week. So it made it even more like a party/ fun day when the Blarney wheel kept hitting the Game Of Fate EVERY time! Did Draw Race and gave away 45.00, did a round of Pictionary which was fun and the whole chat got to participate in that and gave away 20.00 and did Magic Touch and gave away 30.00, and then did a game that had never been hit before but it was so disfunctional that i think its going to be removed eventualy. And gave away 15.00 to a new face on the stream. Look forward to drawing for all of you and have a great weekend! See you guys Monday for the launch of a new feature on Drawing Request Show :) Things are about to get shaken up! Miss the stream? Heres a highlight of the first Blarney Time giveaway! Thanks to all who came out made it fun. Was a hoot! EWG Special: 2017 St Patricks Day Chibi Sale! 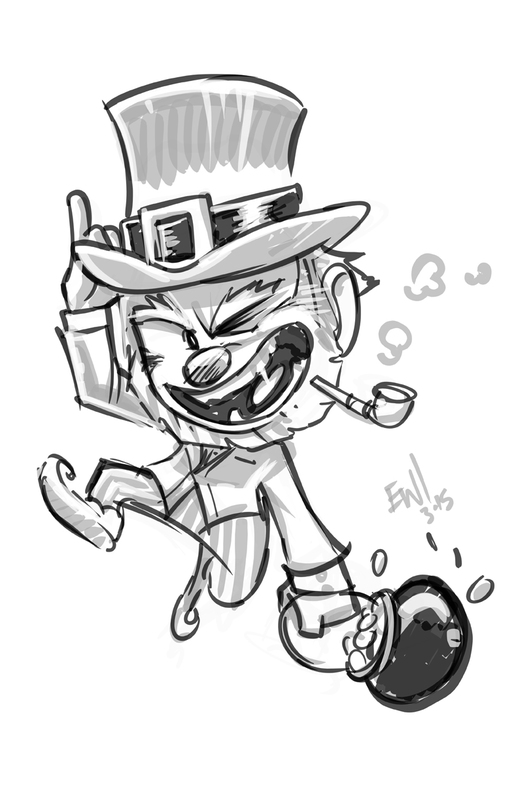 In the spirit of the Leprechaun filled holiday, EWG presents the St Patricks Day Chibi Sale! 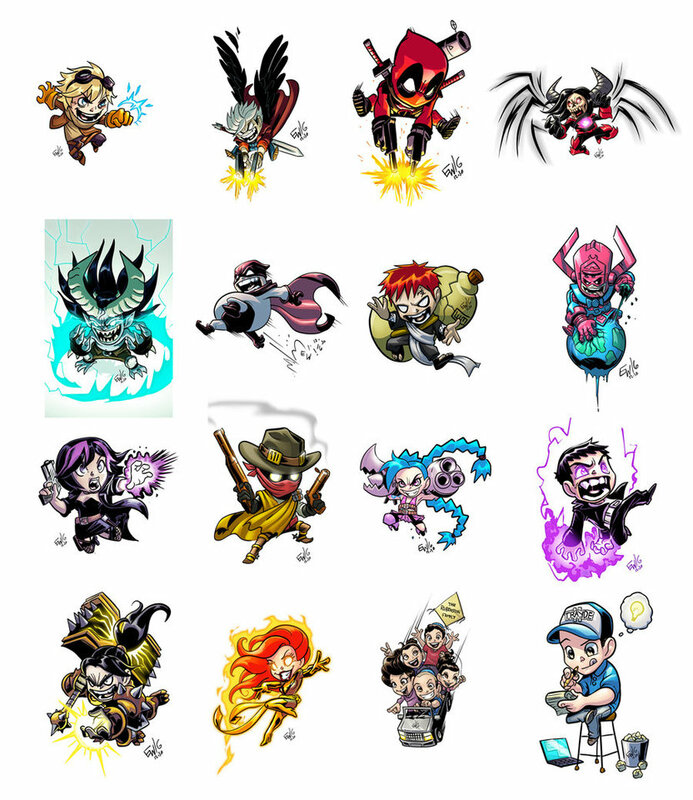 This sale runs all weekend and offers customers fun energetic EWG style chibis at 60% the price! This weekend only, they are available for $30! Use the cart below to order as many as you want before the sale ends! 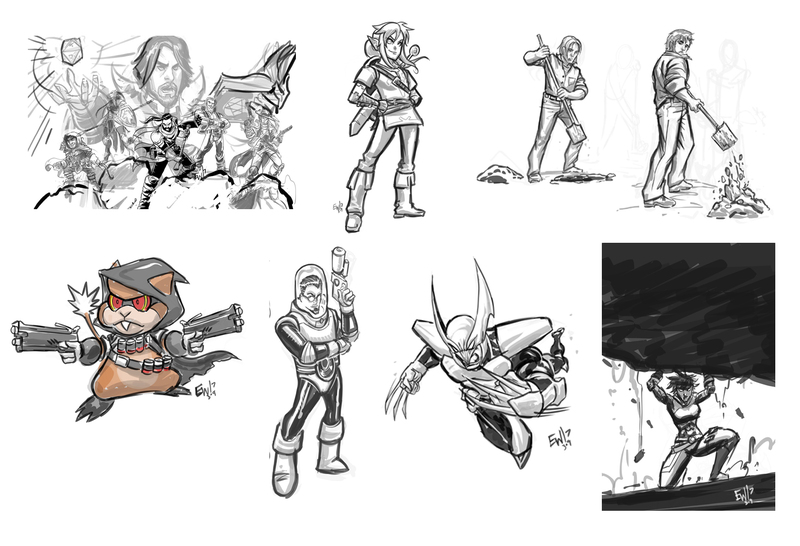 One chibi style character/ penciled/ inked/ colored on 11x17 300dpi canvas - jpg emailed Click 'Buy Now' to add to cart. Can change quantities and review cart before checkout! Sale closed. Thank you for your orders! 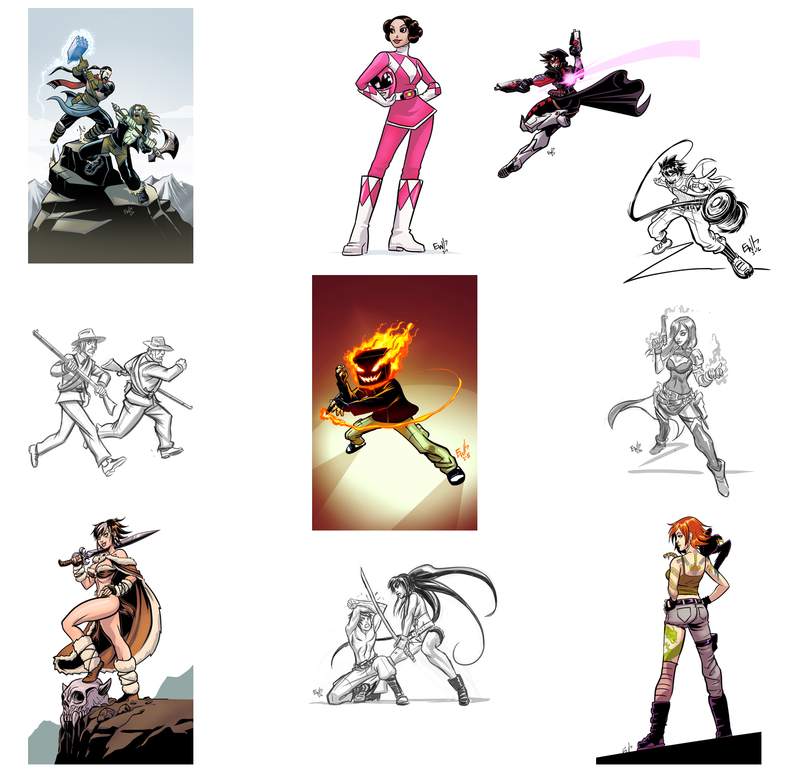 -Can be any original or fan art characters. -Include details in your Paypal order upon checking out or send to eryck@eryckwebbgraphics.com separately. -Cart comes down when sale ends. 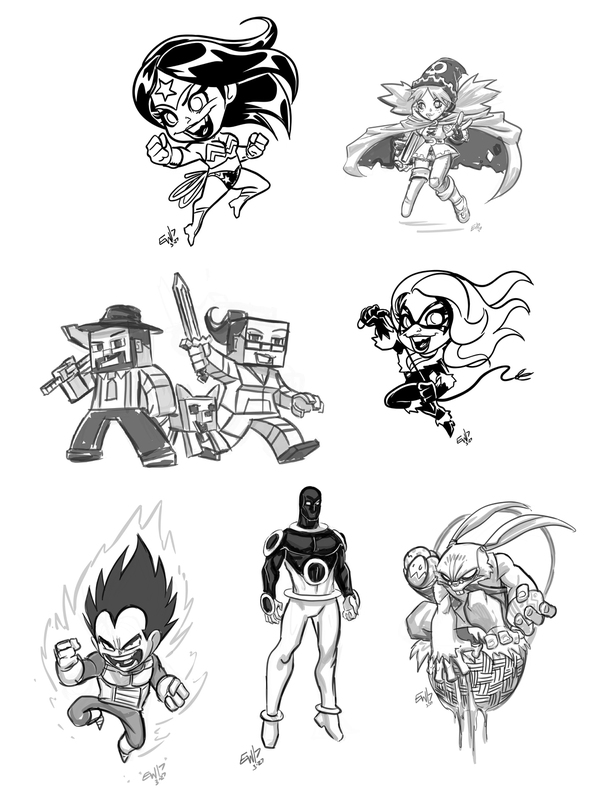 -Chibis are done in order of received 1 to 2 a day until finished. Depending on demand you should get your finished orders in 2-3 weeks! -Sale runs from launch on Thursday 3/16/17 till it ends 3/20/17! -Orders not guaranteed to be streamed on Drawing Request Show or any other time. But occasionally some might show up on EWG Production streams. This is up to EWG's discretion. -Must pay via Paypal before order is added to queue. -Must provide one solid picture of reference. 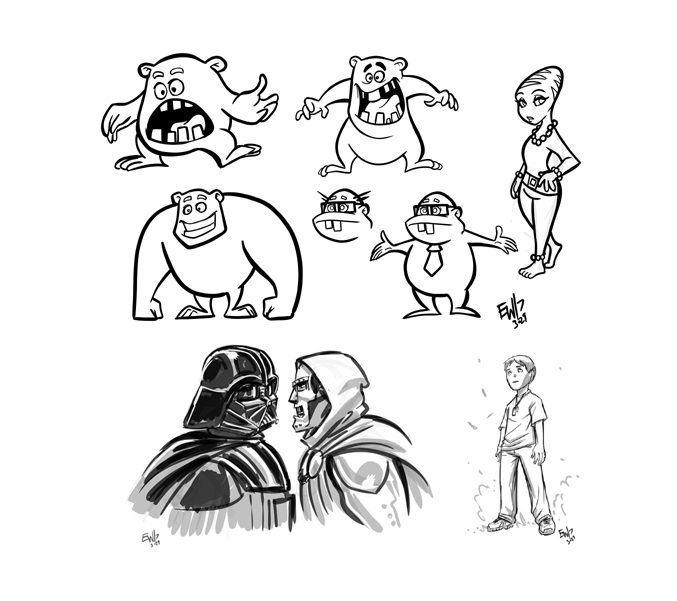 These are not for character design. As of this post, all art sent! 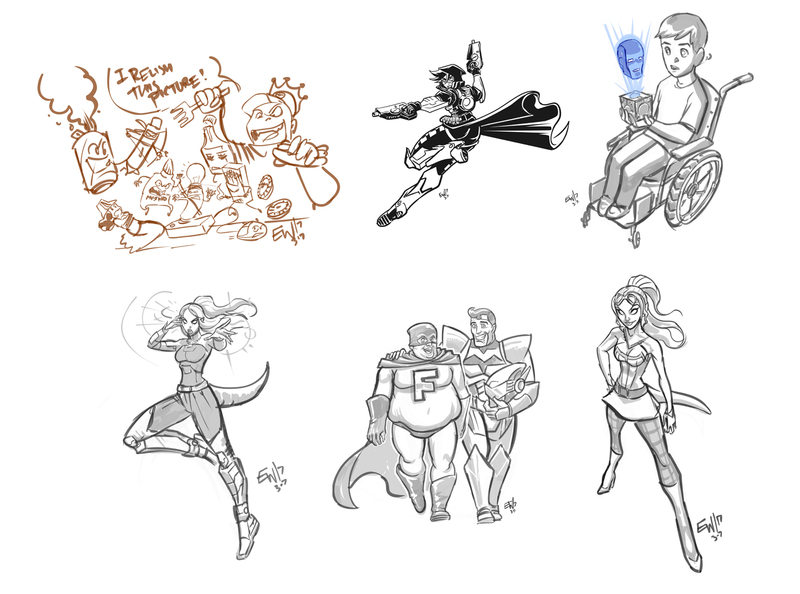 So this is the collection of Drawing Request Show related artwork done today. 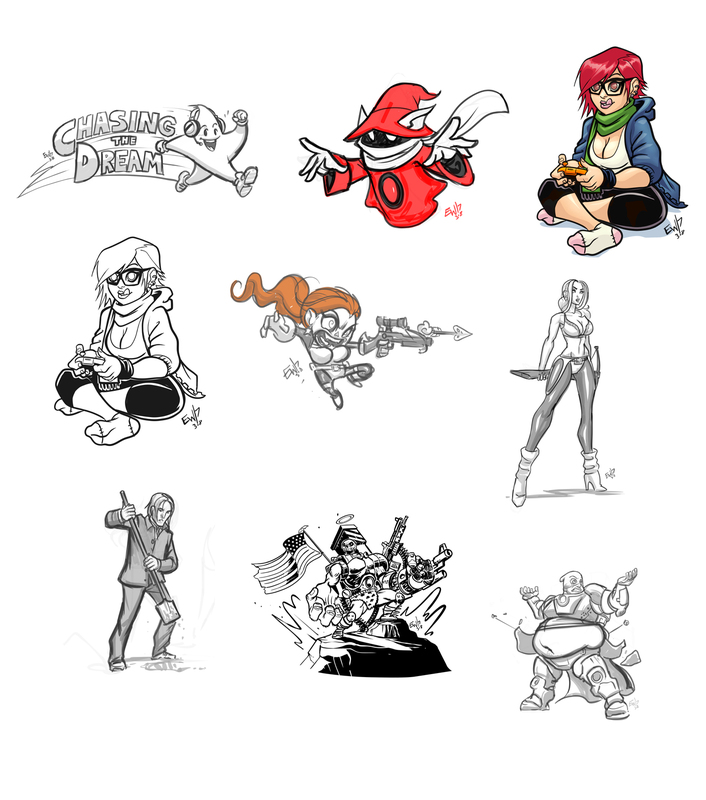 6 full color pieces done and sent, 6 new drawings done during the request stream. And more to come! Thanks everyone for a fun day of streaming and arting! Can't wait to do it again tomorrow. Oddly enough I didn't realize to a little bit ago after streaming that we passed the Follow Goal by 2 Followers. So we will have a Follow Giveaway tomorrow during the St Patricks Day stream! Also please be sure to come out 2pmEastern Time for Drawing Request Show tomorrow 3/17/17 because will have some St Patricks day shenanigans going on and some surprises for folks who come out all stream. See you then! As of this post, all art sent! Had a fun stream today. Started out very quiet in the chat and such then folks started showing up and the stream turned into a really fun one. 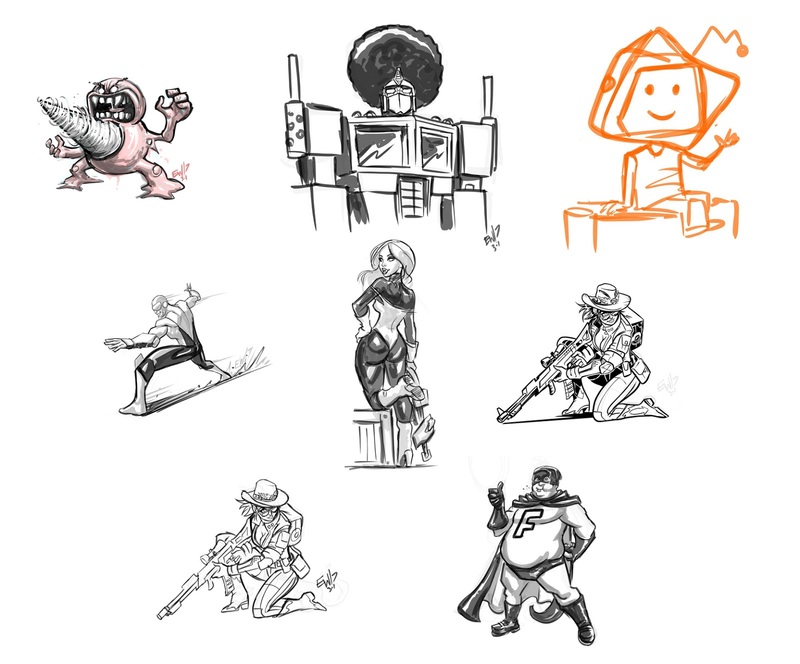 My goal is to draw equivalent of 7 drawings a stream. Well we did 8 today so not too shabby! Even wrapped it up with some fun Gratitude Spins, a Tip Goal giveaway and last drawing of the stream won by KingKonigTiger! See you guys back out tomorrow 10amEST for Color Upgrades stream then Drawing Requests at 2pmEST! Till then.... good noit! 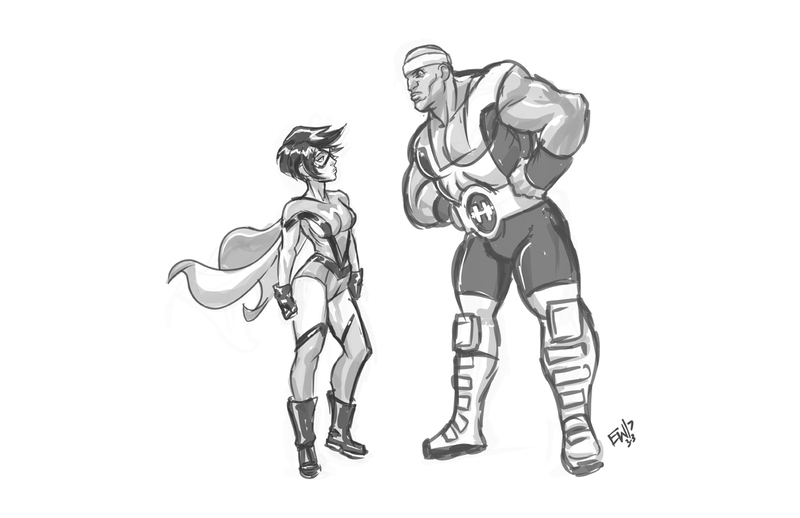 Wanted to warmup this morning before plowing through some comic strip work this morning. This was intended to be sort of a TNC style depiction of a leprechaun but ended up being something slightly different. Anywho, good enough for a 10-15 minute sketch! 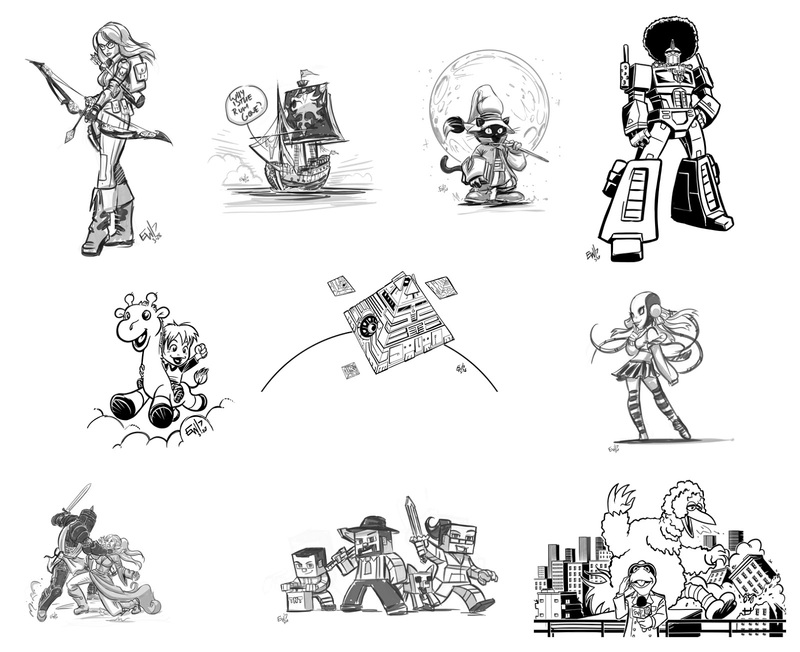 All drawn in Inkscape (of course :) ) - have a great Wednesday all! The leprechauns are coming! The leprechauns are coming! As of this post, all art sent! Check your whispers as I'm dropping links to folks in whisper currently. Just seems faster. So above is the contact sheet for all the artwork I drew today. 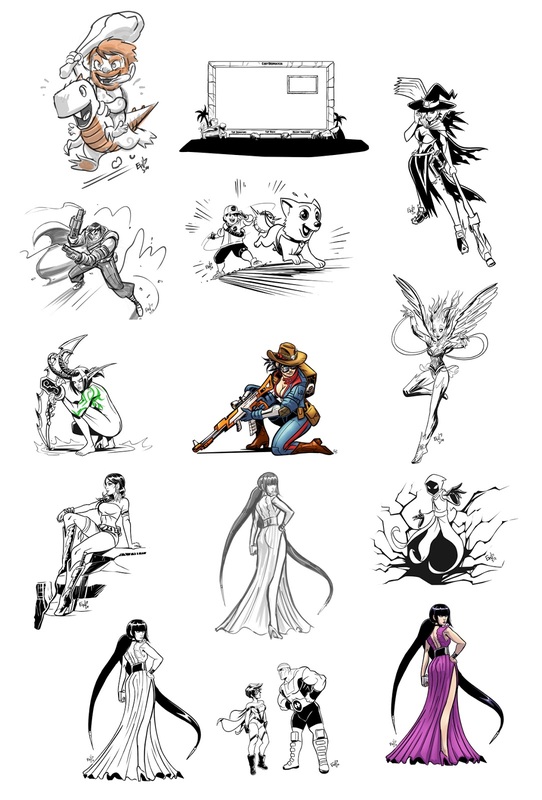 It encompasses all art related to Drawing Request Show stream... including this mornings ink upgrades (8) and the rest done on the afternoon DRS stream. Had an outstanding day of pushing the limit and seeing how far I could go. Also upon finishing inking the girl with the purple dress, i had 5 minutes left and a challenge occurred upon me to try and color it in that time. Well I would have needed about 10 minutes. But I still flew through the flats and initial shades. Oh well, challenges are good for growth right? Fun at least. Had a running bet with the viewers that if the one remaining follower to hit the follow goal happened today, I'd do an extra drawing giveaway. Cause i was betting that it wouldn't happen today. There was also a side bet with Trayde that if it happened today, I ink a drawing for him for free. And if it didnt happen today, he had to pay $15. Trayde and the chat won, but Trayde was gracious enough to toss me a killer donation anyway. That man... keeping the butter on me and Kristina's bread I tell you. Along with many others. Thank you everybody for getting DRS to 520, and we're already well on our way to 530! Thank you to all the amazing lurkers, watchers, tweeters/ sharers and donors. This stream is already so much more a thing than I ever thought it would be. Thank you! As of this post, all art is sent! 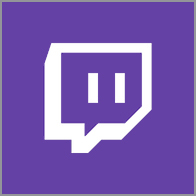 I dropped your download links via twitch whisper this time. So go get em! Thanks for a super fun stream, drawing was on point. Everything was a blast. Heres to doing it again tomorrow. Tomorrow morning I will be streaming ink upgrades. And Drawing request show will be back at 2pmEST! 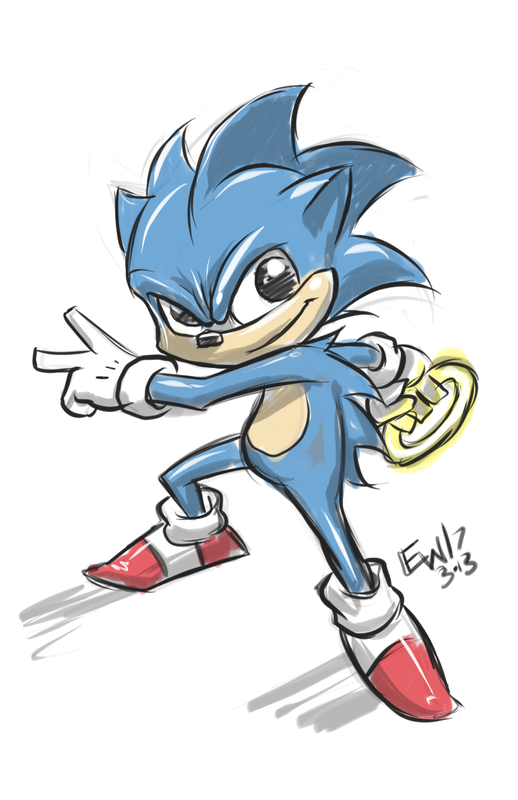 This rough sketch of Sonic The Hedgehog was done in Sketchbook Mobile on my Samsung Galaxy Note 10.1 this morning for warmup. I started sketching and scrapped the first one to start over and this one came out a bit better. Overall the whole thing is not great, but it works out some weekend kinks to definitely by the end I was more in the right frame of mind and warmed up to do some client work. It will be well into later today or tomorrow till i hit my stride but this is a good start. 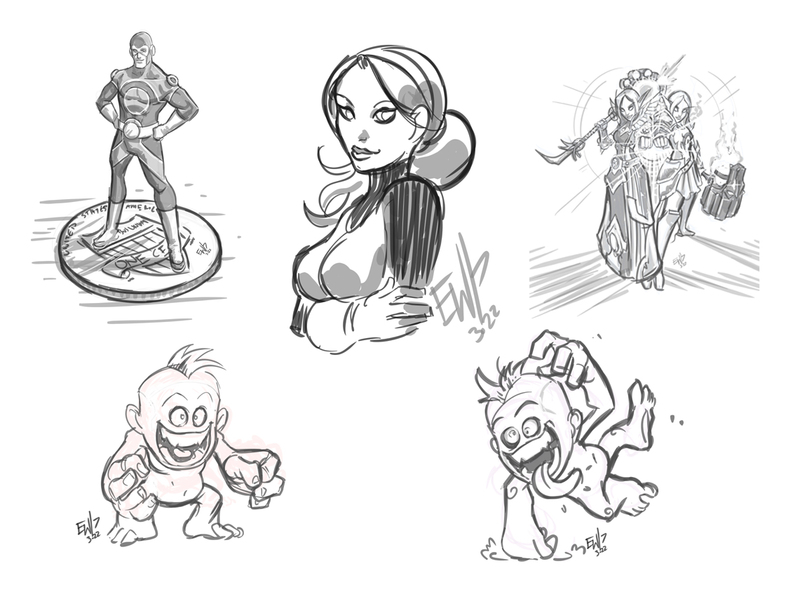 Going to start trying to do a 15-30 minute warmup each morning to keep up the practice and draw my best. What do you do to start your day/ prepare for your work? #intuos #wacom #tip #stylus The intuos pro ( intuos 5) comes with the wacom stylus 2nd gen, and the stand comes with a clip to change the tip and about 6-8 different tips. I tried out a more rubbery one and am digging the extra tactile sensation and friction. Don't know if anybody but me can tell from this test drawing but I am digging it, and excited to try it out this week for client work and on Drawing Request Show! Thing is while i have several plastic tips they only give you like 1 or 2 rubber tips. So, if it becomes a preferred thing I'll have to order more from somewhere some day lol. But thats 1000s of hours of drawing down the road. Wanted to post the chagne and I'll do a follow up here in the reference section about my experience with it and if i go back. While the plastic tips glide like drawing on a sheet of glass this one glides more like drawing on a sheet of paper with the slightest texture. Kinda neat. May allow more control. Will test drive this baby give a follow up end of the week! 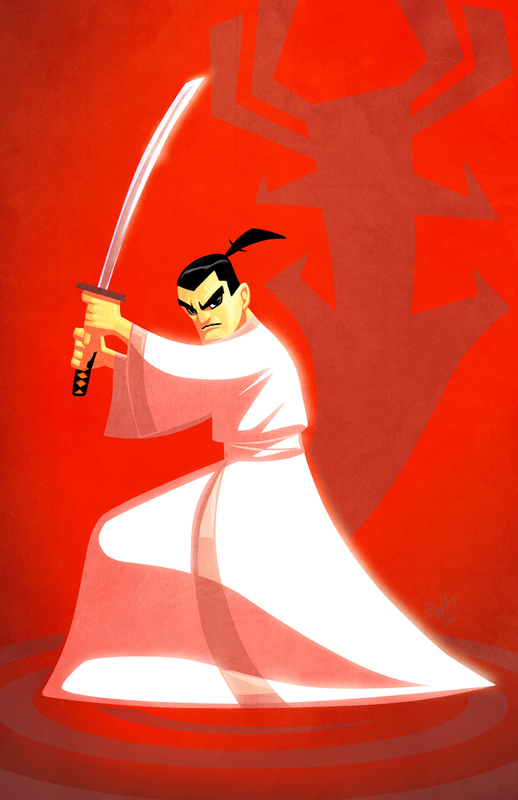 Saw some fanart drawings by other artists on my facebook timeline this morning refering to the final season of samurai jack. Whether its come out yet or not I'm not sure, but it reminded me I used to love that show, and so it prompted me to do a warmup drawing of jack during today's Drawing Request Show - it was OK, but it was good enough to inspire me to finish it as a proper fanart. So tonight while hanging out listening to streamers on twitch tonight I tweaked the warmup drawing, then inked it then colored it. Only when I started taking away the overlying lineart did it start looking like a proper representation of the samurai jack style. Then i did some texture/ lighting filters and such and touched it up to get this final look. Fun stuff! 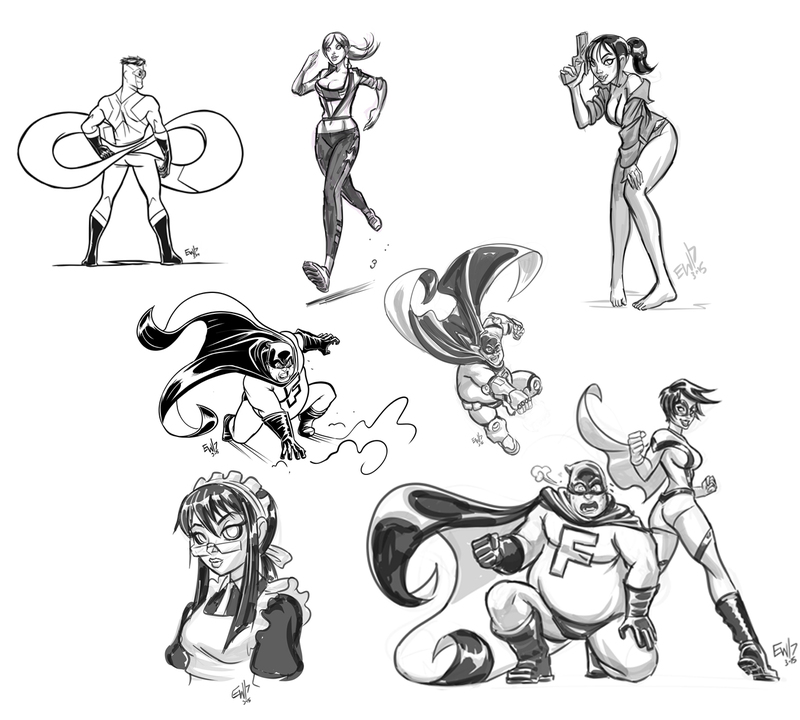 Was really nice/ fun to do some personal art much less fan art of a character/ series I've always been a fan of. I had fun playing with the lineless style which is something i've always wanted to play more with. Enjoy! Hope to do more fanarts along these lines very soon! As of this post, all art sent! Thank you so much to all who came out made today a great stream. i had a ball. 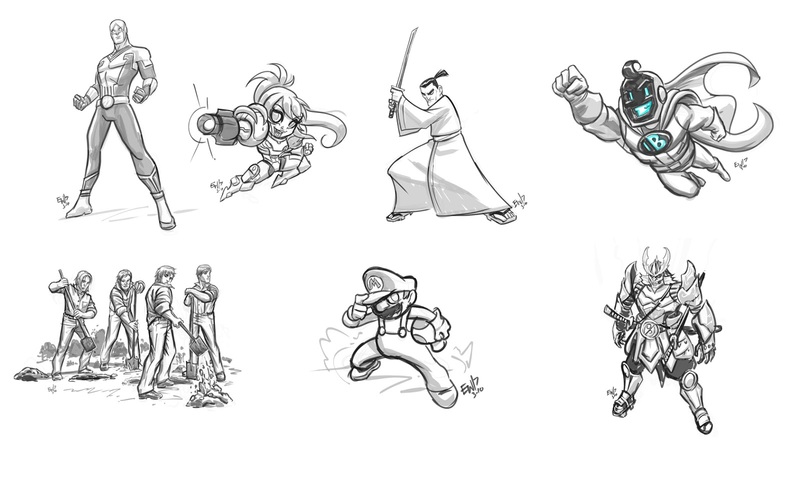 Started with a Samurai Jack for myself for warmup in anticipation of the final season coming announcement, and continued with chibi samus, some mario action and ended with a free-reign super hero bitly. Love it. Love you guys. Have a fantastic weekend and see you monday!!!! Missed it? Check out the clip below. See you at the next live DRS M-F 2pmEST! Also... dont forget to change your clocks if it effects you. (I like it now... why cant they leave it alone). Sorry if theres some encoding issues. I blame twitch. As of this post, all art sent! Had a stingy/watery eye thingy goin on all afternoon must have touched my eye with something it didnt like. But it didnt hinder the drawings! Had some fun ones and some new faces hanging out today. The top left of the above pictures was a 15minute layout assembly. This piece will now be inked/ colored at a future date. Congrats to MrThunderKid on his two raffle wins, first for an INSTA token, and second for Last Drawing of The Stream! See you guys tomorrow for the last DRS of the week. I got some ideas in the works for future streams i think everyone will dig. But for now just going to finish up the week tomorrow. See you M-F on Twitch at http://twitch.tv/eryckwebb for fast paced drawing, and rock n roll! As of this post all art sent! Thank you to everyone came out and supported and encouraged me today! Just when I needed it :) Happy to say we're over the hump (week wise and life challenge wise) on this home-ownership sewage system dilemma and I'm excited to get back to normal. Still monitoring the system for any more issues and adjusting for probably the next week but its usable and functional and crisis is averted. And its not going to bankrupt us as we originally feared. So the mental distractions are starting to minimize and the artwork is starting to rebound. Had fun on today's stream. Drawing my usual stream goal of an average of 7-8 pieces. There were a lot of distractions during the stream and breaks and randomocities. So I didnt draw as fast or get as much done as I would have liked. But its better than some past streams where I only got one piece done or so. Will try to make up for not doing an upgrade stream this morning by either doing it tonight or most likely Friday morning! See folks out for DRS 180 and more every Monday through Friday 2pmEasternTime at twitch.tv/eryckwebb! As of this post, all art sent! DRS 178 was supposed to be my triumphant return after a crazy support train by the requesteers on Friday and having Monday off for personal must dos. Well between the marathon wheel stream on Friday, the 6+ hours of driving on Saturday, the dealing and stressing about the sewage drain issues in our basement that developed and became a more and more expensive issue over the weekend/ Sunday especially. And now this week with getting it all fixed and hoping its not a bigger issue that it could potentially be... I was a little low energy/ exhausted for today's stream. Im hoping to rest up, tackle some good food and entertainment tonight and go to bed early and hit the ground running in the morning. Stay tuned to twitter for if I go live with a inks upgrade stream in the morning. Otherwise see folks 2pmEST tomorrow! As of this post, this artwork is sent! Where do I even begin. DRS 177 will be one I'll never forget. I've had a few donation trains before like on a birthday or something, but today was a massive one that I never would have expected. Thank you so much to Trayde, LeoKage, KingKonigTiger, Lynxie, Ecto, Cody and Preventerice for the AMAZING stream. I got this two character [ pictured above ] drawn, went to do a giveaway for hitting the tip goal, and the donations erupted from there. Unlocking 5 more giveaway spins, 40 gratitude spins total for the folks listed above and then the stream ended with the TOP 3 Supporters of the week getting a thank you spin each! Heres a highlight below of a small portion of this epic and unexpected stream. Thank you so much! You guys want to support me like this? I'm so happy to give back via wheel prizes and do it all stream if you guys so make it happen. We'll get em all drawn starting when DRS returns Tuesday 3/7/17 2pmEST! Only on twitch TV! See you at the next live Drawing Request Show! As of this post, all art sent! DRS 176 was a fun one and including the morning Upgrades stream where I worked on colors, I got done 15 pieces! Thank to all who came out and supported/ watched/ lurked / enjoyed the stream. Sorry for StreamLabs botchery and heres to it working better tomorrow hopefully. See you guys tomorrow for a TGIF edition of Drawing Request Show! Only at twitch.tv/eryckwebb! As of this post all art sent! DRS 175 was a fun way to get through the middle of the week. 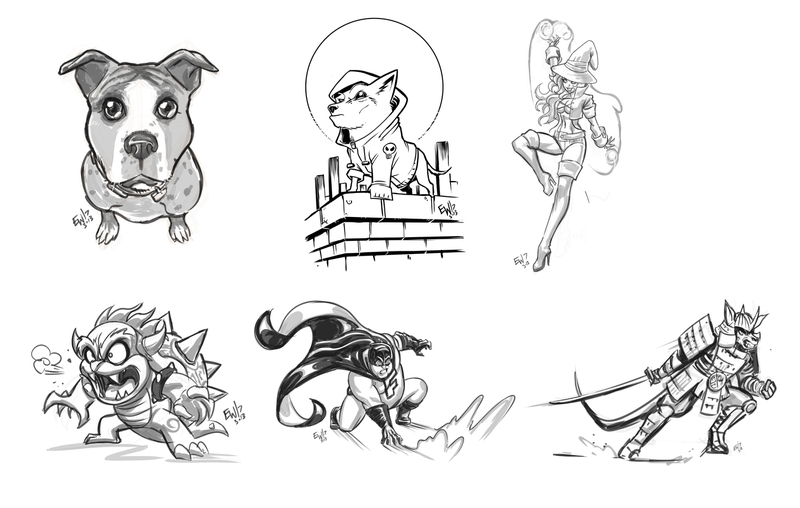 Drew lots of draws, had a Follower Goal giveaway and a Tip Goal giveaway and a few Gratitude Wheels! Thank you so much everybody for your requests and we'll do it again tomorrow with Upgrade Stream in the morning and the regular DRS at 2pmEST! Miss it? Heres a clip from one of my favorite drawings today! See you at the next Drawing Request Show on Twitch!